This verse, found in the last chapter of Habakkuk, was a repeating of the psalmist’s writing in Psalm 18:33 and was probably a section of the Temple prayers that were chanted with the accompaniment of instruments during Temple worship. What was the psalmist and the writer of the Habakkuk trying to say in this poetic and oft quoted verse? Immediately, a mental picture comes to us as believers; we are standing on a lofty place, surveying the valley below, with God by our side. Learning something about the land of Israel, it’s topography and it’s wildlife, will reveal a picture and a life lesson perhaps at first you didn’t see in this verse. First of all, although much of Israel is very arid, the topography is extremely rough and rugged. The wilderness, which covers the eastern and souther parts of Israel is the most rugged of all. 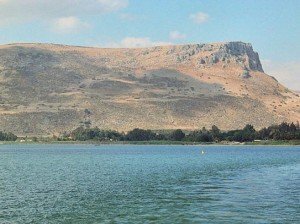 In a distance of 40 miles, the topography changes from 1300′ below sea level near the Dead Sea to 4000′ above sea level around Jerusalem. This was the Judean Wilderness that was home to most of the Old Testament Bible characters. Abraham, Isaac, Jacob, Moses, and David were wilderness dwellers that made their living in this harsh environment. The main animals that inhabit these remote and rugged areas are the gazelle, which is a small antelope, and the much larger Nubian ibex which is a species of goat. Although at home in the mountainous areas, the gazelle prefers the gentler terrain and smaller slopes. Conversely, the ibex lives in the roughest, steep terrain that it can find. Their hooves are built almost like suction cups to help them to traverse the steep rocky cliffs they call home. What then is the hind or the deer that some translations have for these verses? A hind is a female red deer that is native to Europe and there are no deer species native to the land of Israel. Could it be that something is missing in the translation of this word? If, as many scholars believe, the ibex is the animal being referred to in these Biblical passages, then a great Bible life lesson begins to unfold. When we pray about the future, we always ask God for smooth paved paths, with curb and gutter, no rocks, and plenty of park benches for resting along the way. We don’t want to face the trials and tribulations that are often a very real part of this life on earth. A sign of maturing in the Christian faith is realizing that God often puts us in wilderness situations where the going is tough and the path strewn with rocks, to teach us to trust Him, when our strength and scheming won’t get it done. The next time you find yourself in a rough and rugged patch of life, instead of asking God for a way out, ask him for the feet needed to walk the path He chose for you. In a study of the gospels and the book of the Acts of the Apostles, several times Jesus and His followers were brought in front of a body of rulers known as the Sanhedrin. Jesus went before the Sanhedrin in Mark 14:53-55, Peter and the apostles were sent to the Sanhedrin in Acts 5:27-40, Stephen was brought before the Sanhedrin in Acts 6:12, and Paul was forced to appear before the Sanhedrin in Acts 22:30. What do we know from history about this group and what was its function in the Jewish time period that Jesus was here on the earth? A look into history reveals some interesting information. Sanhedrin (with a capital “S”) – referring to the highest Jewish judicial council in Jerusalem, under the leadership of the high priest. It was the final authority on Jewish law, much like the Supreme Court. During New Testament times it was made up of seventy members plus the High Priest. This arrangement came from Numbers 11:16, where God told Moses to elect seventy elders to help Moses carry the burden of leading the people. Membership in the Sanhedrin was conferred by appointment and an ordination ceremony called S’mekah, that involved the laying on of hands. The appointment was evidently for life. Members came from three groups; chief priests, scribes and elders; although it is not clear how they were divided out. Some sources say that during the time of Jesus, the Sanhedrin consisted of the High Priest, sixty five Saducees, and five Pharisees. We know there were Pharisees on the Council because Nicodemus was a member of the Council (John 3:1) and also Gamaliel (Acts 5:34-35), but evidently they were a small minority. 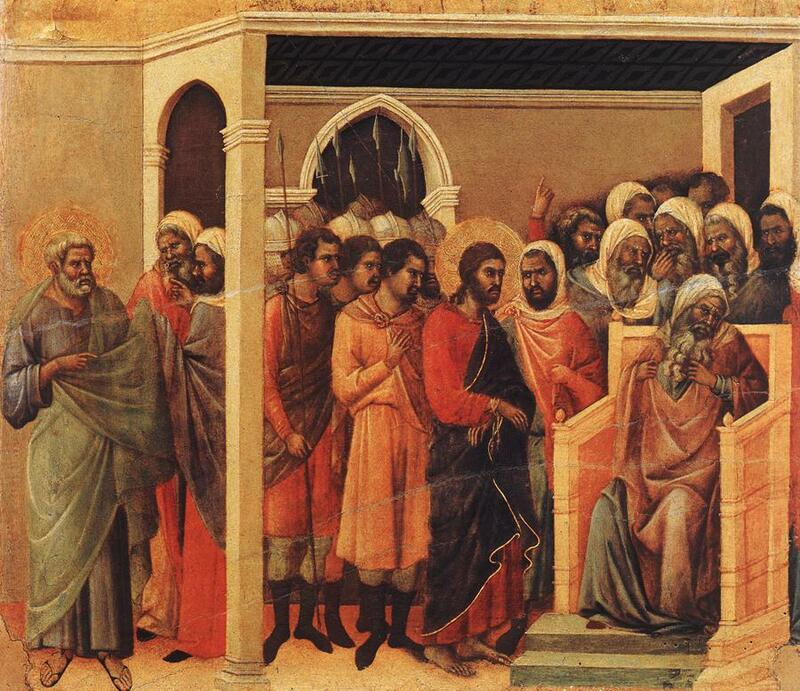 The Pharisees represented the lay class of people, while the Saducees were all aristocracy. This mixture and the different beliefs that each group espoused led to a sometimes hostile environment (see Acts 23:9-10). Sanhedrin – can also be a place, as in the building, where the Council met (council house). The Council met in a place called the “Hall of Hewn Stones” in the Temple complex in Jerusalem. Several scholars argue that Jesus was taken not to the Council itself, but to the building where the Council met. sanhedrin (with a little “s”) – as in a local ruling council. Every town and every synagogue and even the Temple itself had a ruling council that governed their local affairs and this council was also called, “sanhedrin”. This is similar to the way in which organizations in the United States are structured today; each having a president, board members, and rules of order. When you read, “Sanhedrin” in the story of Jesus’ trial, it is possible that it could have been the local council in charge of the Temple and not the Supreme Court that sent Jesus to Pilate. Even if this is true, it wouldn’t diminish the seriousness of what they did, but would totally change who did it. If the whole Sanhedrin body had been present, you would have expected some remarks and defense by the Pharisee group similar to what happened in Acts 5:34 and Acts 23:9-10. If, in fact, it was not the huge body that represented the whole Jewish nation, but a small group of Temple officials who convicted and condemned Jesus, then it begins to make more sense. The Temple officials were very angry at Jesus when he turned over the tables in the Temple and called them a den of thieves. He had upset the whole Temple economy. Caiphas’ remarks in John 11:49-50 supports this thinking process. They had to get rid of Jesus, not because of his religious beliefs, but because he was a threat to their livelihood. In summary, because of the three possible definitions of the Hebrew word translated into Greek as Sanhedrin, there are several theories as to who and what was actually involved in the trial and crucifixion of Jesus. It is just an interesting thought that maybe it was a smaller Temple council, the sanhedrin, that gave the orders to send Jesus to Pilate and not the much larger ruling council that might have given Jesus a fairer hearing. 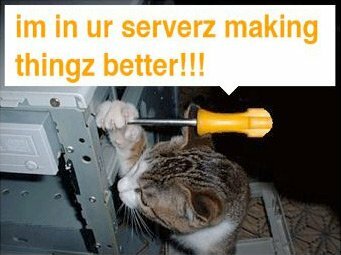 This site has recently moved to another server. In an ideal world, such a move would have been transparent to our readers. Alas, the move did not go as smooth as we hoped and this blog has been up and down for the better part of two days. Please bear with us as we continue to make changes to the site. In the interim, should you notice anything awry with the blog’s operation, please tell us about it in the comments section below. Please note that you may need to update your bookmarks and RSS feeds to point to http://www.dodsonlumber.com/Acts242/ (notice the capital “A” in Acts242) and http://feeds.feedburner.com/Acts242 respectively. In 19 B.C., when Herod the Great began his most ambitious building project to rebuild the Temple to YHWH, he wanted everything done on a grand scale. The Temple enclosure that he built was the largest religious structure in the world at that time by two and a half times. It was 1200′ long North to South, and 900′ wide East to West and the Temple itself was fifteen stories tall. 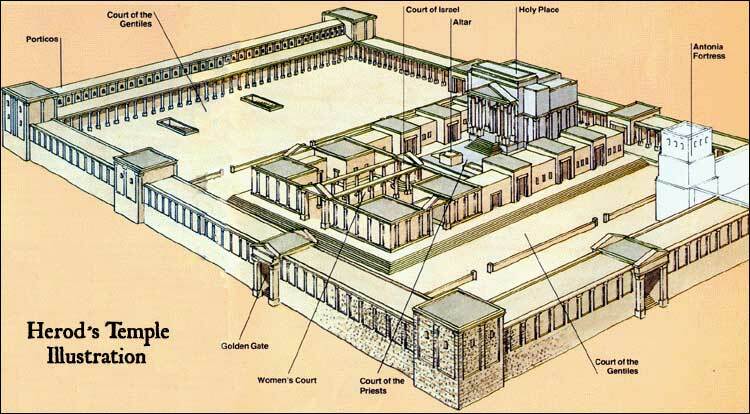 The Temple grounds consisted of five different courts; the Gentile Court, Court of Women, Israelite Court, Priest’s Court, and the Holy of Holies. By far the largest of the courts was the Gentile Court. The Gentile Court was 1200′ in length and surrounded the entire Temple area. It was paved with marble and was surrounded by colonnades on all four sides. This court was the Jew’s way of responding to the Prophet Isaiah’s decree five hundreds years previous, in Isaiah 56:3-7, that all the nations of the world would come to Jerusalem to worship YHWH and that his House would be called a House of Prayer for all the nations. It was not called the Gentile court because Jews didn’t go there, but because this was as far as the Gentiles could go in the Temple enclosure to worship the Jewish God. A low wall separated the Gentile Court from the Temple enclosure itself. This wall was called, ”Soreq”, in Hebrew, and had thirteen openings in it to allow Jews only to enter from the Gentile Court into the four other courts. No Gentile was permitted past this dividing wall. “No Entry” signs were posted on the wall in three different languages. 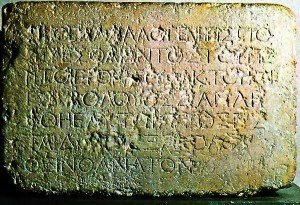 In fact, one of these signs in stone has been found and is in the Museum in Istanbul, Turkey. It reads, “No foreigner is allowed past this point on penalty of death”. This fits perfectly into the story in Acts 21:27-29 where Paul is accused by the Asian Jews of taking Trophimus past the barrier and into the place that was for ”Jews only”. All this took place during the Feast of Pentecost, so the entire Temple area was packed with pilgrims coming to the Feast. A riot started and the Romans had to step in to save Paul from being killed by the mob. Now re-read the passage in Ephesians 2:14-15. The words of Paul suddenly jump off the page as we see the picture he is trying to present. Was Paul talking about the Soreq? Jesus’ coming was intended to break down the barrier between Jews and Gentiles and do away with a need for the two to be separated. This story is another great example of how knowing about the world of the Bible helps us to understand better the words of the Bible.